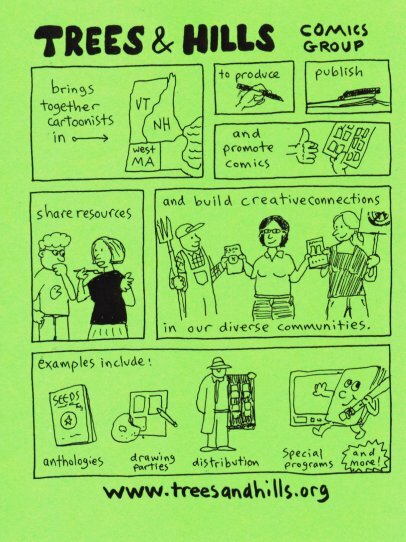 If you’d like to post your comics news, email organize@treesandhills.org. Please consider submitting your work to Whole Terrain! Whole Terrain is a literary and arts journal devoted to reflective environmental practice. http://www.wholeterrain.org/. This year’s theme is the significance of scale. Colin -Great job of keeping the Trees & Hills Group out in the world. You are a creative organizer. I always enjoy your publications. I had no idea of the extent of your promotions. Thanks, Judy – it’s not just me, though! Co-founder Daniel Barlow works his magic from Montpelier, and numerous others lend their hands & thoughts here & there.